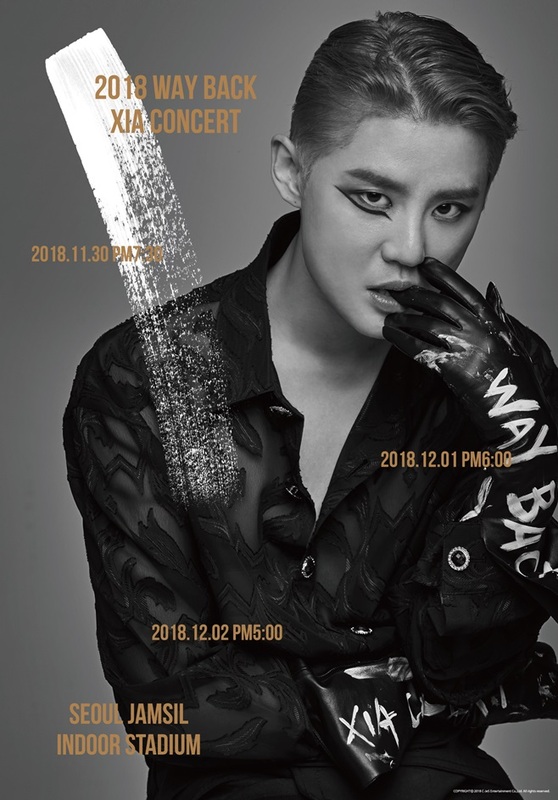 2018 WAY BACK XIA CONCERT was a three-day domestic comeback concert of JYJ’s member Kim Junsu. The show was Kim’s first headlining concert after completing his South Korea’s military service for a year and nine months, and two years three months since his last Xignature tour. C-JeS Entertainment first announced the start of the Way Back concert with shows in Seoul on November 6, 2018. MelOn Ticket was the ticketing agency for the shows in Seoul and the sales took place on November 8, 2018. LOOK Korea was the only exclusive authorized dealer and travel agent for international and Japanese fans. Kim enlisted in the South Korea’s military on February 9, 2017. On November 7, 2018, Kim held a special fansigning event at COEX Live Plaza after discharging from the military two days earlier. Kim performed songs from all of his Korean studio albums including Tarantallegra, Incredible, Flower and Xignature albums. The shows lasted for about three hours. 18 songs were performed in each show. In the set list, Kim also covered Sukima Switch’s 2004 track “奏(かなで)(Kanade)”. XIA held a ‘Genie Time’ corner, where he grants three wishes of his fans on stage. A 20-second video teaser was released to promote the shows in Seoul on November 9, 2018. On November 16, 2018, C-JeS Entertainment released another new 43-second concert teaser clip promoting the same shows through JYJ’s YouTube channel and Kim’s V LIVE channel. In an interview with Arirang TV under the Showbiz Korea program aired on November 14, 2018, Kim revealed that the concert features up to 70% to 80% dance tracks as opposed to his regular 50% ballad and 50% dance tracks in his previous concert tours. The first concert poster was released on November 20, 2018. Tickets sold out nearly instantaneously for the three-night Seoul concert, with tickets completely sold out within one minute on the first round of sales on November 8, 2018. JYJ bandmate, Kim Jaejoong, attended the first day of the Seoul concert for the very first time in all of Kim’s solo concert performances. The list of goods was revealed and pre-orders for two official merchandise started two days ahead of the Seoul concert through C-JeS Store website. All merchandise were showcased and contained in a large display box outside the stadium. This page was last modified on December 2, 2018.